Spring is the perfect time to bake cookies for a celebration. I had the good fortune of creating a small batch of festive treats for my dear niece’s fifth birthday this past weekend that I’d like to share with you, because they’re very appropriate not only for a birthday party, but for a spring lunch, dinner, wedding shower, anniversary or family gathering. The best part about these cookies is that I kept the designs quite simple in order to make the baking project fun for all of you. While going through my collection of cookie cutters I thought about what my niece would appreciate and adore. From two sets of spring-themed cutters I created a flock of lilliputian bunnies, chicks, eggs and butterflies that bespeak the season. I have a good feeling she’s going to like them. In fact, cookies from my kitchen are the first thing she requests whenever I ask what she wants for her birthday. It's a sweet thing to be sure! After making two separate recipes of my beloved cookie doughs, I set out to roll, cut and bake a myriad of adorable cookies. Then it was all about tinting the colorful icings in pastel shades to evoke spring. Sugars, candies and other embellishments were taken out of my baking pantry and placed in individual bowls so that I could work efficiently. With all of this completed, it was time to start decorating. You can well imagine that a baking project like this takes time and patience. However, with a bit of planning and forethought cookie decorating can be as enjoyable for you as it is for me. 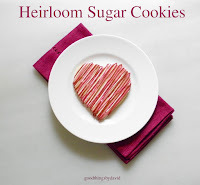 As you may know, my Heirloom Sugar Cookie Dough and Heirloom Chocolate Cookie Dough make such great tasting cookies. For my niece's cookies I decided to add vanilla beans to the doughs for extra flavor, straight from the bean and not out of a jar. With my collectible Martha by Mail cookie cutters all set out and ready to go, I then rolled out batch after batch of cookies. Not all of the cookie cutters were collectible. I used an Ateco cookie cutter as well as an antique tin daisy cutter to create flower cookie pops. You can see from these photographs that I always cut my cookie shapes as close together as possible, so that I get as many cookies from the first roll out. One wastes less dough this way. 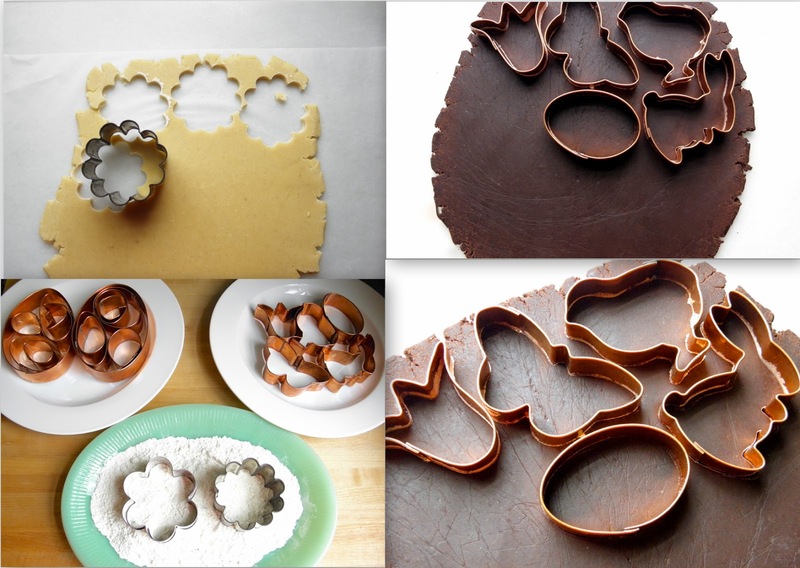 Always have a plate of flour nearby to dip the cookie cutters in between each cut so that the shapes release easily. Bake the cookies according to my recipes and let them cool completely. Create the royal icing and divide them into bowls for tinting. Either use squeeze bottles or piping bags that have been fitted with appropriate piping tips. For my cookies I used #2 & #3 piping tips. 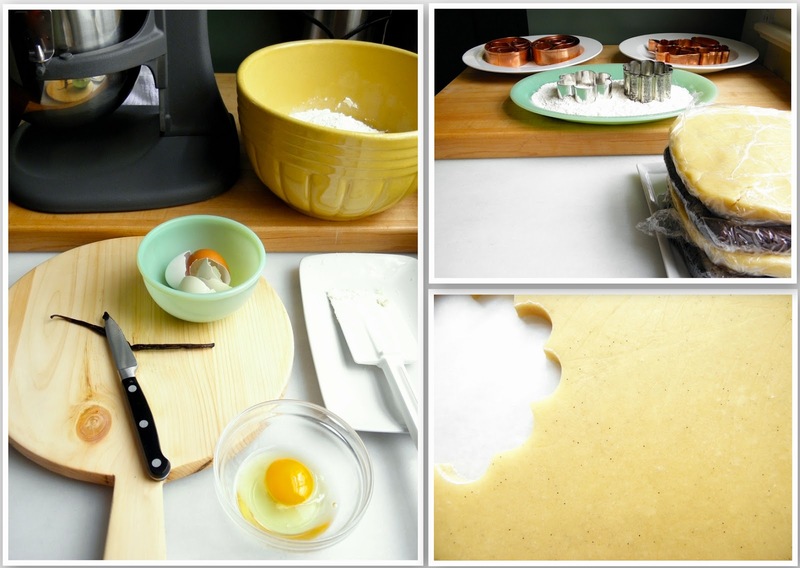 The photographs above show you how I like to work whenever I set out to create cookies. I decant all of my sanding sugars, candies and other embellishments into small bowls. Tools that help me drop and spread the decorations are all kept on a platter. Everything is within easy reach. Working on a rimmed baking sheet, I ice and flock my cookies. Any excess sugar that doesn't adhere to the icing gets put back into the appropriate bowl. Nothing is wasted. If I'm not flocking the cookies, I like to ice each one on top of a cake turntable. This allows me to turn the cookies and ice at different angles. For me, it makes icing fast and simple. These flower pop cookies were so adorable! I outlined and flooded each cookie in pastel colors and dropped pearl candies onto each petal. Some had extra pearls in the center, while others were treated with alternating color petals. The jadeite pots filled with fresh snowdrops and daisy cookie pops, while having chicks and bunnies hopping and bopping around the 'meadow' make for an enchanting tableau. As I said before, simple icing and one pearl candy for an eye makes these little creatures so special and cute. Chocolate bunnies and pastel-colored peep cookies are bound to be loved by both the kids and adults. Create something similar this spring! Since these cookies were bound for the west coast, I made sure to package each into a clear cellophane bag that was tied with a pretty ribbon. Colored Easter grass was used to line and cushion the box for mailing. What I hope is that you take an idea or two from my Spring Birthday Cookies and apply them to your next baking endeavor. With many of you celebrating milestones this season why not take the opportunity to bake and ice some beautiful cookies? You don't have to get elaborate with your icing decorations to make them wonderful. Remember to have fun when creating your cookies! First, Happy Birthday to your dearest Audrey!! Secondly, David... You've outdone yourself again! Honestly! I LOVE your collection of cookie cutters (especially the bunny/chick/tulip/butterfly/egg set, which eludes me!) And, your decorations are perfect-perfection for the season! It's snowing here so I wish to thank you a bit extra for this Spring-time post! Thanks for wishing my dear niece a Happy Birthday, Janet! That means SO much to me. :) Can you believe she's already going to be 5?? Oh snow! I wish it would go away already! Have a good one and remember, Spring will finally be here shortly. Such a lucky little girl to have an awesome Uncle David! I think the cookie pops are my favorites. Darling. Kenn, I do hope you create some cookies this spring. Just so you know, that hatching bunny & hen remain among my all-time favorite MBM cookie cutters. I can't get enough of them! These are stunning!!! I want to eat these right up, they look so delicious. 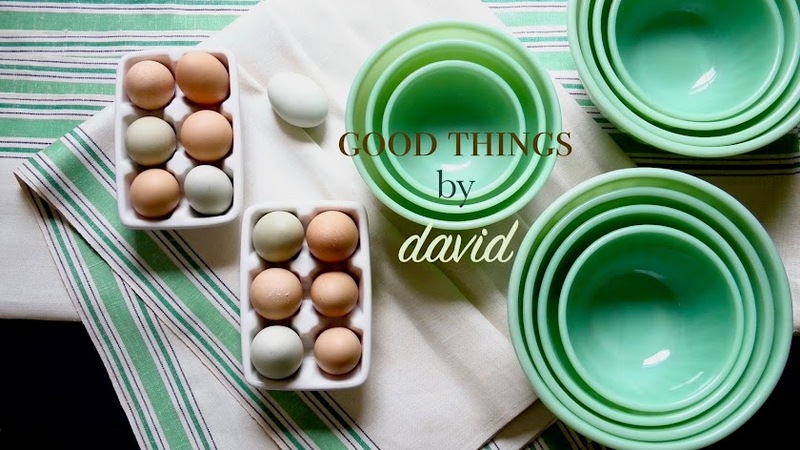 David, how do you get the shapes to stay so perfectly? My sugar cookies sometimes get misshapen when I bake them. What's the secret? How adorable! I'm so gonna copy this at home! I have some similar cookie cutters. I can imagine how happy your niece will be when she opens that box :) She's lucky to have an uncle like you! Thanks, Anette & Debbie! 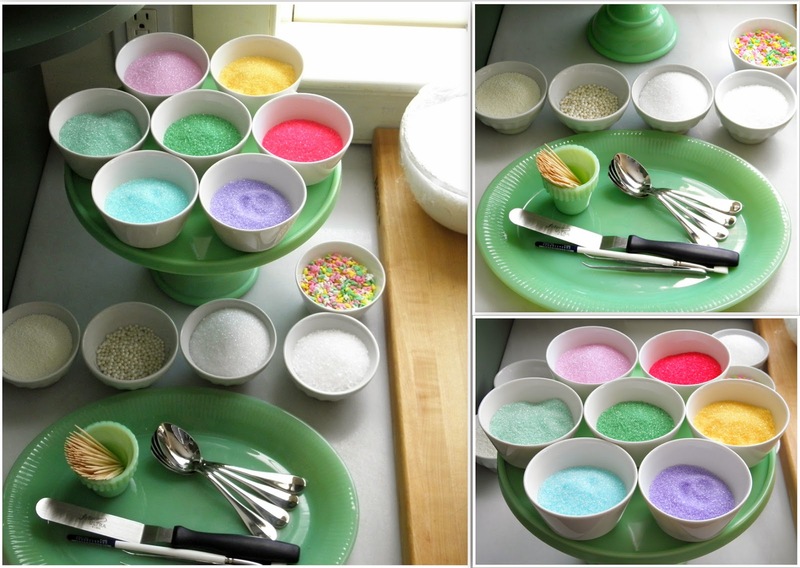 Bake some spring cookies soon and enjoy! Magnificent. I am totally into your "less is more" style of cookie decorating. There is something so whimsical and endearing about the little creatures you make. Thanks, Carol! Yes, sometimes cookies ought to be decorated with a minimum of fuss. At other times, it's OK to be artistic and get a bit carried away with one's artwork. I'm always amazed by what people create! Debbie, my cookies used to spread when baking. The secret? Line sheets with parchment, roll cookies out and place on parchment, then place cookie sheet in refrigerator for around 15 min. Carol, that is good advice. It's always good to chill the cut out cookies before baking in order to retain their shape. It helps tremendously! 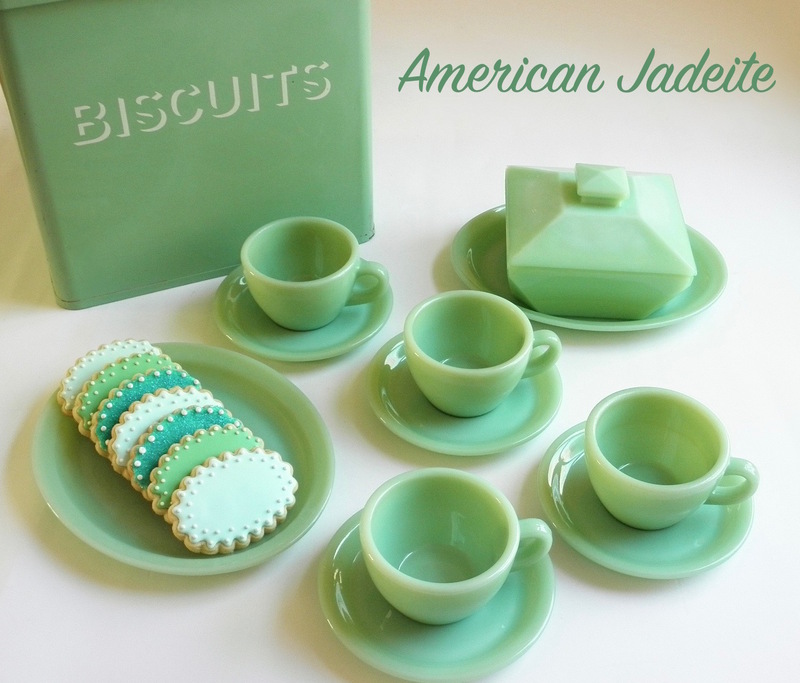 oh my goodness that jadeite wow just love it so much!